Fewer and fewer literary publications are accepting snail-mailed submissions, so writers who prefer to use typewriters or handwrite their manuscripts will feel more pressure to type their final draft into a computer in order to submit their work via email or a submission manager. The good news, however, is that programs like Evernote or Microsoft’s OneNote mean you don’t have to change your writing habits. Writers can simply upload a picture of their handwritten or printed manuscript, and the app will convert it into an editable Word file that is ready to be submitted! Be aware, these programs often work better with typed text than handwriting. Writers who aren’t comfortable with computers often shy away from using them because they feel overwhelmed by options. The seemingly endless series of tabs and drop-down menus can leave you feeling paralyzed by choice. But there’s now a solution, thanks to programs like FocusWriter, which offers a no-nonsense, distraction-free experience emphasizing simplicity above all else. It’s perfect for any writer who wants to get back to the basics, and it even includes optional typewriter sound effects for the nostalgic among us! While it’s possible to write without having to interact with a computer, the same cannot be said about the submission process. The vast majority of publications require that submissions be made through online submission managers or via email, and they often require that your manuscript be formatted according to a particular set of specifications. If you find the technical aspects of making online submissions are totally out of your wheelhouse, ask a tech-savvy friend or family member to guide you through every step of the process. If you’d rather turn to professionals for assistance, the submission strategy experts at Writer’s Relief can help! Face Your Fear—And Conquer It! 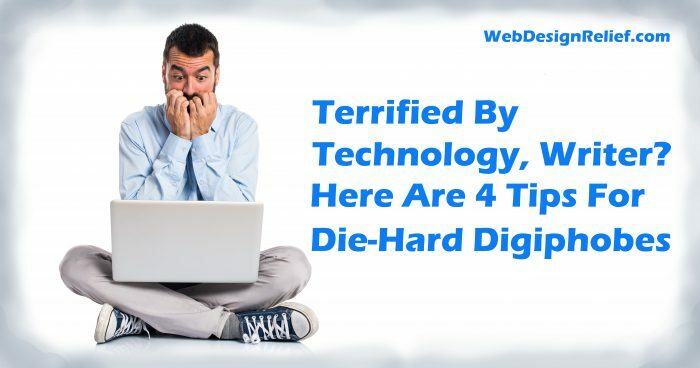 The more you know about computers and how they can make your writing life easier, the less scary and frustrating computers will be! Computers and the Internet can be great time-savers. No more correction tape or scribbling out—just hit delete and type in your edits! And on a cold, rainy day, conducting research from the comfort of home has great appeal. If you want to take the first step toward dealing with your computer qualms, here’s a beginner’s guide to using a computer. You can also sign up for a computer course at your local library or community college. Question: Do you prefer using a pen and paper or a computer keyboard? Creative writers who blog tend to drive more visitors to their author websites than those who don’t. But what are the secrets behind a successful blog? 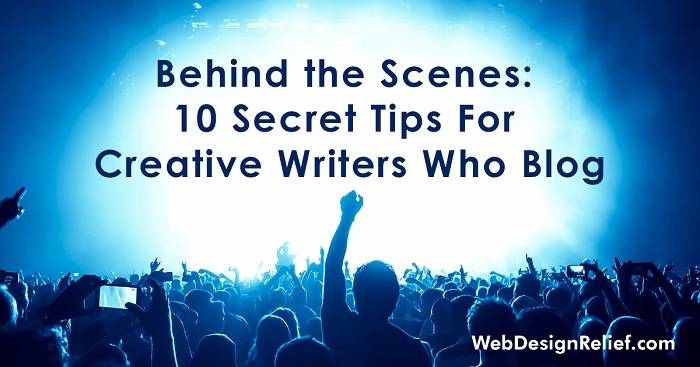 The experts at Web Design Relief offer ten insider tips for writers who blog! Provide relevant metadata. Metadata is the text that is visible to search engine algorithms. When you provide a relevant metadata description, it’s easier for people to find your blog. These 156 characters represent the first point of contact with your author brand, so make them count! Learn how here: Through The Eyes Of A Search Engine: Metadata And Your Searchability. Get new traffic to old posts. At a loss for new content? Promote your older blog posts on Twitter by using special hashtags like #WaybackWednesday or #ThrowbackThursday. Use a great blog post title. Don’t let an awesome post languish because of a boring title! A great title sells the content of your post to people who see it on social media, RSS feeds, etc. Use a web analytics tool like Google Analytics and URL shorteners to see which titles drive the most traffic to your site. Comment on other blogs. When you comment on other blogs, you gain backlinks and a higher volume of traffic, all while building your author brand. Leave thoughtful comments that show you’ve read the post, and use a Gravatar—an image that follows you from site to site to help cement you in readers’ minds. Don’t forget to add your site name next to your own name to further increase traffic when you comment! Optimize your images. You have the option of adding alternate text for the images you upload to your blog, which can also boost your SEO efforts. Image-alt text describes the image for search engines, so it’s important to provide descriptive and informative filenames for your images. Include keywords and use hyphens between the words for best results. Discover the secret of the Yellow Box. Yellow is a color that draws the eye. Consider presenting your call to action in a yellow box (or whatever color matches your brand) within your blog post, and make it easy for readers to subscribe, download a PDF, or buy your book! Aim for clear, concise posts. You have limited time to interest readers before they get bored and bounce to another site. So make sure you’ve eliminated the clutter of filler words and long, rambling sentences. Connect with readers. End each post with a question or a call to action to encourage interaction. Here’s more about how to engage your readers. Ready to optimize your author website’s blog? Before you dive in, check out more tips from Web Design Relief: How To Revise Your Author Website For The Better. Question: Do you have a tip to share when it comes to driving traffic to your blog? 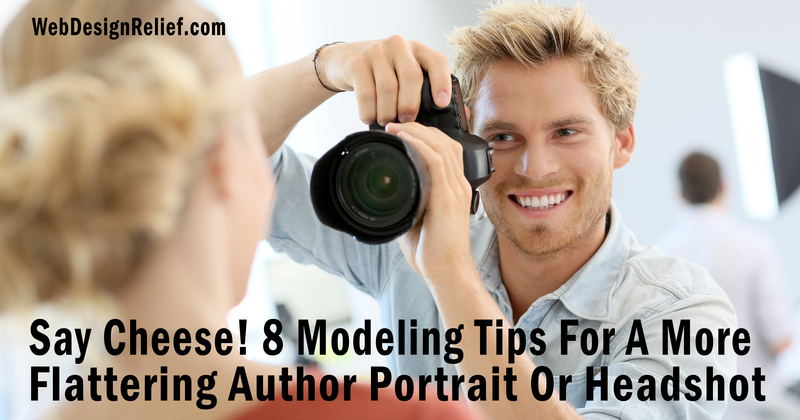 Whether you’re hiring a professional photographer or relying on a friend to hold the camera, you can make the most of your author headshot photo shoot by following these simple tips from the design experts at Web Design Relief. Looking good never looked so easy! Wear solid colors or small prints. Loud prints can clutter an image and draw viewers’ eyes away from your face. If you want to wear big, bold prints, go for it—we won’t stop you! But smaller prints may be easier on the eyes of your author website visitors. And if you go too far in the monochromatic direction, keep in mind that black or white clothing may also present problems in portraiture: White can blow out, and black can lose definition and disappear. Learn what colors look best on you. Know your good angles. Spend some time looking at your face in the mirror. When you tilt your chin down slightly, your eyes will look bigger, giving an impression of approachability. Tilting your chin up slightly can convey a strong bearing. Turning your head to the side, but keeping your eyes on the camera, might give the impression of a writer who has a secret to tell. Play with your expressions and angles so you capture the expression that best represents you as a writer. Lean forward, just a smidge. Leaning forward elongates the neck, emphasizes the jawline, minimizes a soft chin, and puts the emphasis on your eyes. It may feel weird, but it can have great results! Turn your shoulders. Staring straight into the camera can resemble a mugshot and make you look wide. Instead, move one shoulder to a 45-degree angle to your camera lens—you’ll look more approachable and natural. Smile, smile, smile. A single face can wear a thousand smiles—from toothy and unrestrained to subtle and subdued. Try them out in a mirror and then try them out during your photo shoot. Hopefully you have a photographer who can help you “craft” a natural subdued smile but who can also crack a joke and make you laugh in order to catch that gleam in your eye. Squint. One of the best kept secrets for an intriguing headshot? The squint. A subtle squint with a smile lends authenticity to a grin or thoughtfulness to a serious look. Practice a little in the mirror to see what you think. But if looking like you’re trying to see Jupiter without a telescope feels overwhelmingly uncomfortable to you, don’t do it. Better to be relaxed and natural overall. Ask for some headshots AND for some portraits. Unlike the up-close-and-personal style of a headshot, a portrait pulls back the lens for a wider view of you and your surroundings. Use your background to help show who you are as a writer. Write romances? Have your photo shoot in a rose garden. Mysteries? Maybe stand in front of an abandoned building. Or you can simply show another side of your personality: Maybe you’re lying in a field of wildflowers or getting a smooch from your dog. Ask your photographer for a mix of both headshots and portraits. They’ll come in handy at different times. Request black-and-white versions of your photos. Why ask for black-and-white versions of your color portraits? Good photographers know that there’s more to a flattering black-and-white image than simply removing rainbow colors. There’s a whole spectrum of black-and-white possibilities. And your black-and-white photos will look better if they were designed to be shown that way from the get-go (as opposed to having the color stripped by a copy machine). Make yourself comfortable. A relaxed, self-assured vibe can make the difference between a flattering headshot and one that’s bound for the circular file. Consider: What can you do to make yourself comfortable in front of the camera? Bring along a loved one? Make some goofy faces to loosen up before getting serious? Maybe listening to music would help? When you feel good, you look good! Question: Getting your picture taken—love it or hate it?